(NaturalNews) Meet Lauren LaRay, a third grade honor roll student from Las Vegas, who recently impressed the world by getting involved in the fight against cancer. The cute and very bright 8-year-old girl has her very own YouTube channel – Tutorials by Lauren LaRay. Here, she uploads videos wherein she teaches other girls her own age to craft different things. Why? Because she loves videos and she also loves helping others. Recently, however, Lauren learned something terrible about her best friend's little sister, who has cancer and started losing her hair as a result of the chemotherapy treatment. The matter did not pass unnoticed for Lauren, who was inspired to use her hobby in order to help other young girls with cancer. According to the American Cancer Society, more than 1 million people in the United States get cancer every year. Here, one of every four deaths is due to cancer. Although only 1% of all yearly discovered cancers represent childhood cancers, the rates have been increasing throughout the past decade. In 2016, it is expected that approximately 10,380 children under the age of 15 will be diagnosed with some form of the disease. It seems incredibly unlikely that a healthy child would develop cancer, and yet this represents the second leading cause of death in children in the United States. Due to the fact that cancer prevention is still a rather uncharted territory, children who are diagnosed with the disease – and their parents – are forced to turn to oncology and chemotherapy for hope. Nausea and vomiting, fatigue, anemia, loss of appetite and depression, are all reported side effects of chemotherapy. Although it has no direct impact on their physical health, many young girls who suffer from cancer find it extremely difficult to deal with alopecia, or hair loss. Lauren LaRay's friend was no exception. 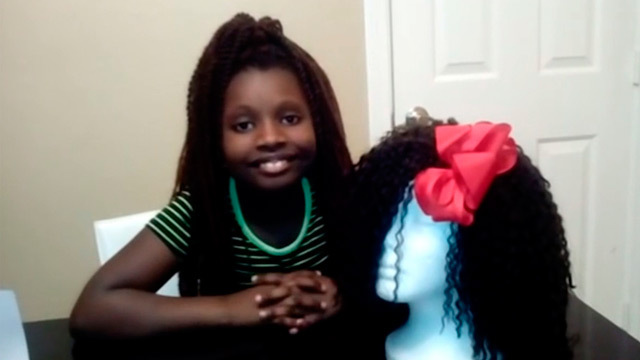 However, Lauren quickly came up with a solution, when she decided to create a beautiful wig for her best friend's sister. And she did not stop there. On the contrary, she was inspired to create another 30 equally charming wigs for other girls who suffer from the effects of chemotherapy. With the help of a GoFundMe Campaign, Lauren managed to raise $720, which she will use to purchase the materials she needs for her wigs. By June, she hopes to donate all 30 wigs to the Nevada Childhood Cancer Foundation, not because she is looking for fame or favoritism, but because she wants to give these little girls a reason to smile. Lauren's kind gesture did not go unnoticed. Jeff Gordon, the President and CEO of the Nevada Childhood Cancer Foundation, explained that little girls suffering from cancer are very much affected by the subsequent loss of hair. He commended Lauren for her kind intentions, and assured her that the wigs she created would definitely bring some normality back to the lives of his young patients. If nothing else, Lauren's donation teaches us that kindness and compassion for others have no age restrictions. She has also showed the world that it doesn't take a billionaire to start a charity. All it took for her to commit to the project was a bit of empathy for her friend, a little financial aid from other YouTubers and the hard work she put into the wigs themselves. At the end of the day, although it might not seem like much, Lauren's contribution will offer a few moments of hope to the little girls who need it the most.